Delve into the world of Indian animals all the best known mammals of India are described and illustrated in this book. Get to know all about their habitats, distinctive characteristics, distribution and other features. Compiled by S.H. Prater from different sources, this book particularly draws on the first hand observations of naturalists who have contributed to the Journal of the Bombay Natural History Society. This book contains 28 full-colour plates drawn by the distinguished artist M. Paul Barruel, depicting 141 species of animals, and 41 monochrome plates. The title of this book may appear confusing to those who quite correctly use the term animal ' to designate all living organism which cannot be described as plants. But in popular usage the word animal ' has acquired a more restricted meaning. It is applied to Mammals, to that single class within the Animal Kingdom comprising animals which nourish their young by milk. Our title as such follows usage hallowed by custom. 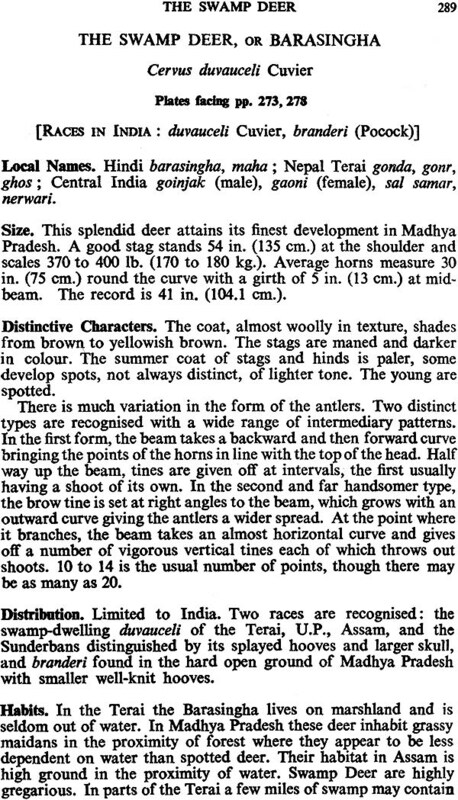 The book of Indian Animals describes the commoner or more conspicuous terrestrial mammals of India. For many years, the Bombay Natural History Society, through the medium of its journal and other attractive publications, has endeavoured to create and stimulate in India an interest in the wild life of the country. The necessity for this interest, particularly among our educated classes, is becoming more and more evident with the passing of time. During the past, extensive undisturbed areas of primeval forest, jungle, and desert gave safe harbourage to wild creatures, and provided guarantee of their survival. But changing conditions in the country, the gradual conquest of forests and waste lands, and, above all, the building of new roads and great improvements in methods and rapidity of transport have left few areas in the peninsula of India which are free from intrusion by Man. These factors have had and are continuing to have a disastrous effect on the wild life of the country. The danger to it has been accentuated in recent years by the enormous increase of firearms in use, and by the inability of many of the Provincial Governments to enforce such Jaws as exist for the protection of wild animals. In the past similar conditions existed in most Western countries. Forests were cut down, streams polluted, and their livestock exterminated to meet the needs of the moment, with no thought of the morrow. Even in tropical lands, gradually permeated with the spirit of material progress, primitive Nature has had to give way little by little to invading towns and settlements. Ruthless destruction of wild life and a prodigal wastage of natural resources have invariably preceded the establishment of a material and prosperous civilization. Thus the magnificent animal life of many tropical and sub- tropical lands and our country is no exception-is being driven to its ultimate retreat in fast diminishing forests, and is today threatened with extermination. Even the great marine animals of the sea, the whales and fur- bearing seals, have not escaped this menace of extinction. The solitudes and vast spaces of the ocean have not been able to shelter them from the rapacity of man. Like terrestrial animals they have been subjected to ceaseless persecution, made more easy by the perfection of means and methods employed in the destruction of life, both human and animal. But in recent years a gradual change has developed in man's outlook upon the domain of Nature. This change has been brought about partly by the spread of education and enlightenment. It is engendering a growing opposition to this wanton destruction of life, however much it may profit the destroyer. It is creating the more humane conception that it is the duty of man to see that the wild creatures of the world are not annihilated. But apart from humanity, which in itself should impel man to grant to lesser creatures the right of existence, there are other considerations which must influence him. The spirit of this age, with its urge for discovery and research, with its marked tendency towards the popularization of science among the masses and the dissemination of its truths and discoveries, is fostering a widespread and intelligent recognition of the immense value to man of the myriads of species, vegetable and animal, which share this planet with him. Today there is no educated man who does not realise that the realm of Nature provides science with a vast and productive field for research. There is none who is not impressed with the belief that such research has given, and will continue to give us, results of great practical and educational value. There are numerous investigations, anatomical, physiological, ecological, geographical, and evolutionary, which can only be made by the study of animal life. While considerable data have been accumulated by the study of dead specimens in museums, or of the living creatures in the laboratory, the' whence, how and where' of his existence which man is seeking to discover cannot be discovered by these means alone. 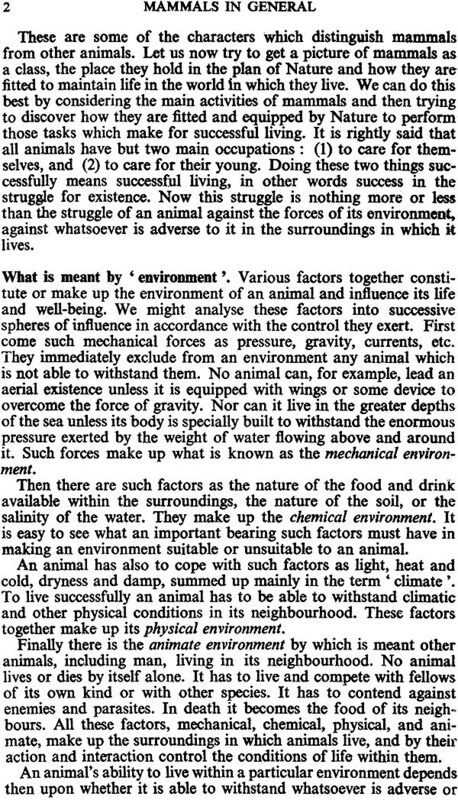 The study of the living creature under the natural conditions of its environment is equally important. It is also true that there are material considerations apart from the scientific. We have been accustomed to look upon beasts of prey as creatures to be exterminated. But with a clearer understanding of the role they play in maintaining the balance of life we know now that even predatory animals have a distinct value. They are a con- trolling influence against overpopulation by species whose un- checked increase would adversely affect the interest of man. On the other hand, there is the utilization for man's benefit of animal pro- ducts such as furs, hides, and horns, which in themselves represent a valuable economic asset. Furs collected from all parts of the world and assembled in London for sale during a single year were assessed at the value of 3,000,000. There is necessity for conserving the sources of supply, which are not inexhaustible. Again, science has revealed, and is continuing to reveal, hitherto undreamed of possibilities in the uses of animal products and their employment in the treatment of human debility and disease. Who can say what pro- ducts still remain to be discovered which will one day be of price loss value to man ? Finally the wild life of a country is a source of sport and enjoyment to its people. It gives healthy recreation to all classes, and is a constant attraction to visitors. It is also a definite source of income to the State because of the revenues realised from the sale of shooting licences and on imports of sporting arms and ammunition. But obviously it is also an asset which may vanish without reasonable efforts for its conservation. For these and other reasons, it is now admitted generally, both in Europe and America, that the natural beauties of a country, its varied fauna and flora, are an asset to its people, an asset to be protected and preserved to their own advantage and to the advantage of future generations. In its fauna and flora, Nature has endowed India with a magnificent asset, an asset which cannot fail to be generally appreciated by its people if they are led to know something of its worth and interest. All those reasons which have made the people of Western countries strive for the protection of Nature within their borders apply with just as much if not more force to our country. Its wild life, in its interest, its beauty, and its marvellous variety, compares favorably with that of any country in the world. There are more than 500 different species of mammals found within the Indian Region. 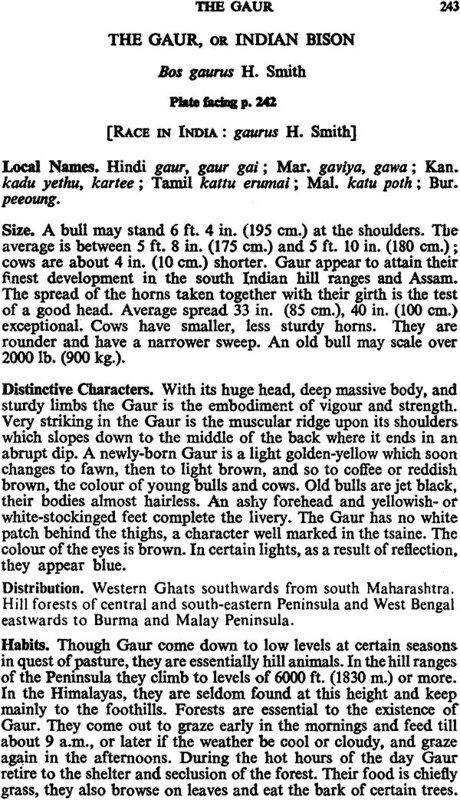 They include the Elephant associated in India from time immemorial with the splendor of her princely pageantry, the Gaur or Indian Bison, the largest of existing bovines, the Great Indian Rhinoceros, the greatest of all the rhinos now in- habiting the world, the gigantic wild sheep of the Himalayas, probably the largest of their race, the Swamp Deer, the Thamin, the Spotted Deer, one of the most beautiful of all deer, and the Nilgai, the Fourhomed Antelope, and the Indian Antelope or Blackbuck, the only representatives of these genera. The beasts of prey include the Lion and the Tiger, the most magnificent of all the great cats, and such splendid creatures as the Clouded Leopard, the Ounce, and the Marbled Cat. Other species, like our Himalayan foxes, martens, gorgeous flying squirrels, and silky-haired langurs, are remarkable for the beauty and the value of their fur. 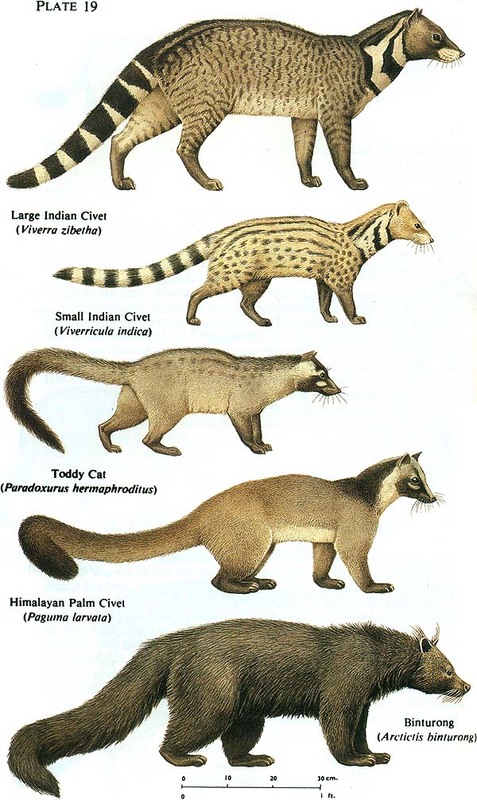 The Musk Deer and the civets provide the musk of local commerce. Other species are remarkable for the beauty of their colouring. Our little Painted Bat (Kerivoula picta) with its brilliant vermilion and black wings is, without exception, the most vividly coloured mammal in the world. Peculiarity in form and structure is displayed by that strange creature, the flying lemur, which is neither lemur nor bat, but which bears the same relationship to the shrews as the flying squirrel does to the squirrels, or by the scaly anteater which, with its long scaly body, looks more like a reptile than any form of mammal. Apart from the interest in their symmetry of form, largeness of size, beauty of colouring, or strangeness of structure or habits, there is always that attraction and charm which the presence of wild life gives to our forests and plains, so dear to the many that live for the out- door life. A further interest attaches to our wild life from its association with the folklore and the legendary beliefs of the country. It is an interest not confined to India alone, but has spread among men of culture everywhere because of the esteem and admiration in which her sacred books and writings are held. 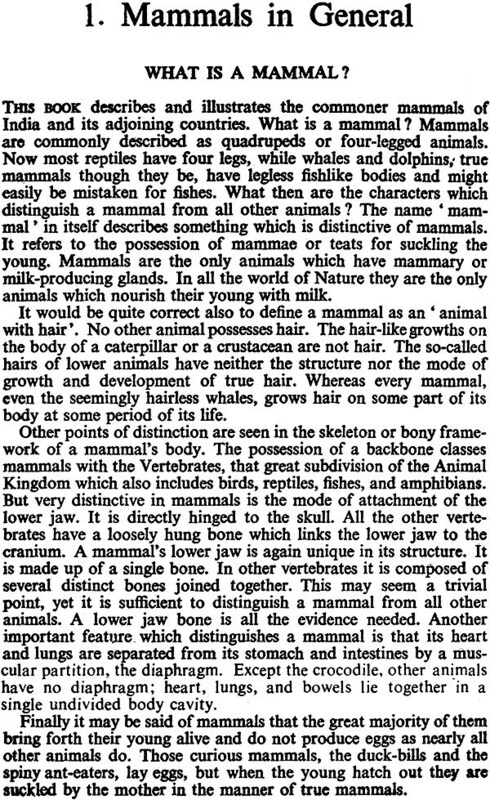 Some 30 different mammals are mentioned by name in the samhitas (i.e. the four principal Vedas). Among them is the Elephant, the favourite of Indra, whose sanctity is enhanced by the belief that eight elephants guard the eight celestial points of the compass. The Langur or Hanuman monkey is held in veneration, as is commonly known, because of its association with other warrior monkeys who helped Rama in his campaign against Ravana. The Lion is one of the many incarnations of Vishnu. The Tiger finds mention in the later Vedic texts. The Mongoose figures in the Mahabharata as a teacher of wisdom to King Yudhistira. The Deer is always associated with Brahma the Creator, and is the constant companion of the god Mahadeva. The Wild Boar is referred to as the Boar of Heaven'. It is told how in the primordial floods Vishnu, taking the form of a boar, raised the submerged earth from the waters and supported it on his tusks. 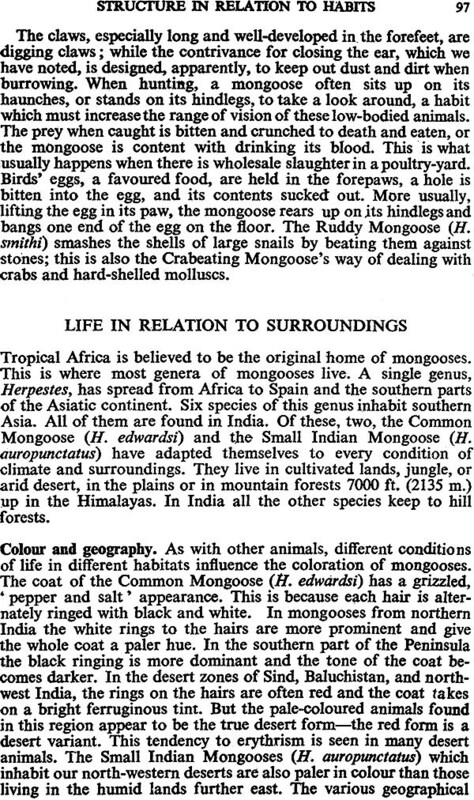 One could cite many more references from the sacred books concerning the animal life of the country. 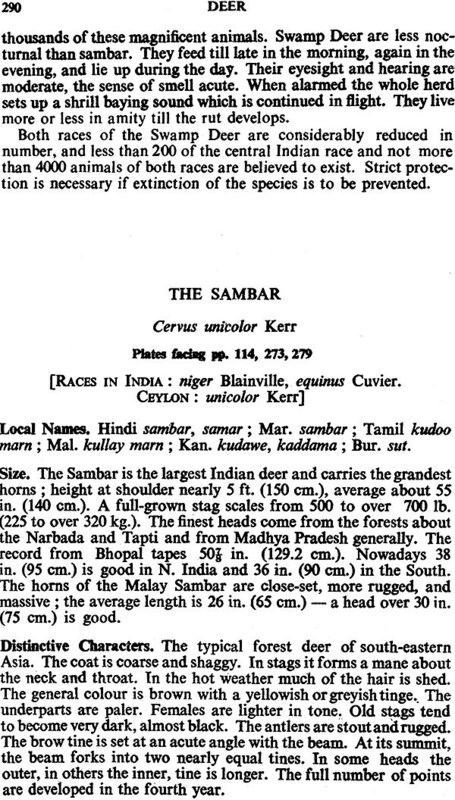 But apart from this, it is of much interest for us to know that the earliest known record of measures taken for the protection of animal life comes from India. The oldest record which we possess today is the Fifth Pillar Edict of Asoka by which game and fishery laws were introduced into northern India in the third century B.C. In this inscription the Emperor had carved on enduring stone a list of birds, beasts, fishes, and possibly even insects, which were to be strictly preserved. 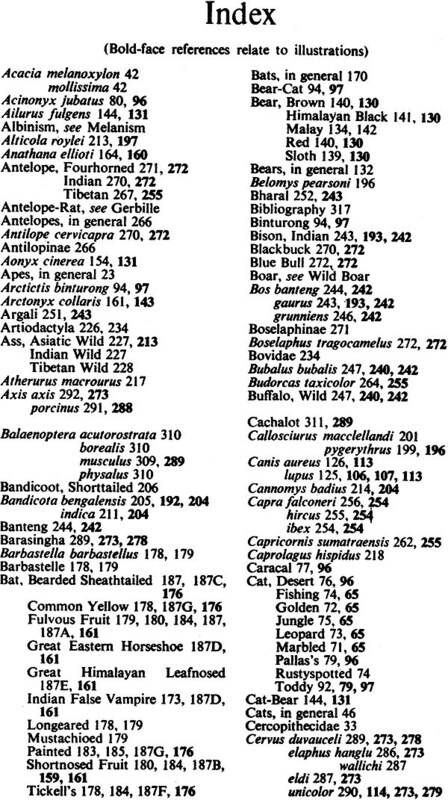 The mammals named are bats, monkeys, rhinoceros, porcupines, tree squirrels, barasingha stags, brahminy bulls, and all four-footed animals which were not utilised or eaten'. The edict further ordains that forests must not be burned, either for mischief or to destroy living creatures'. Centuries later, the Moghul Emperors, sportsmen, men of action, and born observers that they were, displayed a deep interest in the animal life of the country. Their writings are full of descriptions, some in great detail, of the animals, the plants, and the flowers of the country over which they ruled. While Babar, Humayun, the great Akbar, and Aurangzebe display in their writings their love of Nature, Jehangir was a born naturalist. It is said of him that, had he been the head of a great Natural History Museum instead of being the Emperor of India, he would have been a better and happier man. His profuse and engrossing memoirs are a real Natural History of the animal life of India. 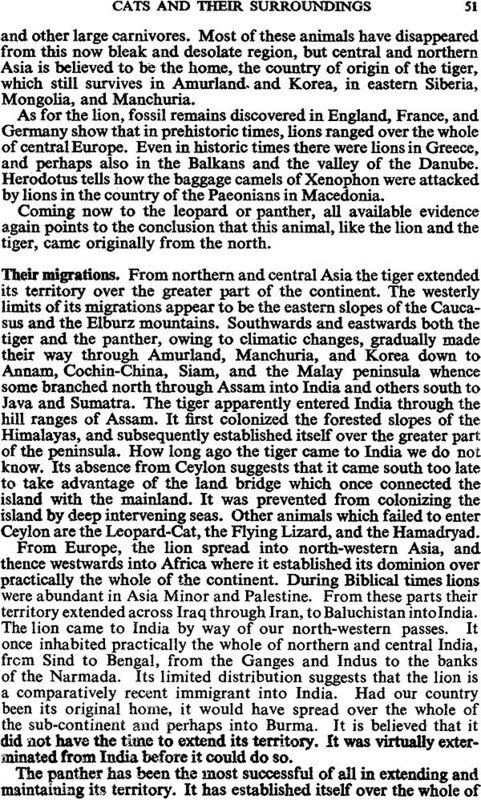 We have endeavored to show how great an asset to our country is its wild life and have given many reasons why we should do every- thing for its protection, But for the protection given to the Lion in Junagadh State and to the Great Indian Rhinoceros in Nepal and Assam these two interesting animals would have been exterminated long ago. The Cheetah, or hunting leopard, once common in Central India, is now almost extinct in the wild state. The Lesser One homed Rhinoceros and the Asiatic Two homed Rhinoceros, once said to be common in the grass jungles of Assam and the Sundarbans, have been practically exterminated in these areas. In many districts wild animals have been totally wiped out. In others, where they were once common, they are now hopelessly depleted. One does not wish to overdraw the picture. There are parts of India where the position of wild life is still satisfactory, though insecure. But equally, there are extensive areas where conditions are so appalling that, if left unchecked, they must lead to the complete destruction of all the larger wild creatures which live in them. There is yet another point which must be stressed. Any scheme for the protection of wild life would be incomplete without due provisions for the protection of our birds. Quite apart from a sentimental value, birds render incalculable service to man. While certain species may damage crops, such harm as is done by birds is overwhelmingly offset by the benefits we derive from them. Without their protection, our crops, our orchards, our food supplies would be devoured or destroyed by hordes of ravaging insects. Birds are the principal agency that controls the bewildering multiplication of insect life which, if unchecked, would overwhelm all life on this planet. Birds by reason of their predominating insect food are an indispensable balancing force in Nature. The abundant bird life of this country is one of its valuable possessions. Those who appreciate its value cannot but strive for its conservation. As far as our wild life is concerned, one cannot expect its preservation in urban land. Nevertheless, we believe that it is time that measures were taken for the protection of birds in urban areas. Areas actually under the control of Municipalities or Local Boards could with advantage be made bird sanctuaries, where the killing of birds is forbidden. There is need to put an end to the wanton destruction of familiar birds which takes place in the immediate vicinity of towns. The second category, land under cultivation provides at once the opportunity for a clash between the interests of man and animal. There are two main reasons for this. Firstly the areas under cultivation in India are extending and will continue to extend to meet the needs of a rapidly increasing population. The need of increasing the available sources of food supply can be met only by the continued absorption of waste lands or forest. The natural domain of wild life secondly there is the equally imperative need of protecting these cultivated areas from wild animals. The depredations of wild animals present one of the most serious handicaps the ryot has to face. In addition to loss of cattle, there is the damage done to crops and, not uncommonly, loss of human life. Therefore, whatever the views of the protectionist, this much is clear. Human progress must continue and in the clash of interests between man and animal human effort must not, after. But this problem has been faced by other countries. Cannot a reasonable effort be made to face it in our own? That an intensive development of 'the agricultural resources of a country may accompany a sane and adequate policy for the conservation of its wild life is shown by the measures taken to this end by all progressive nations. If our wild life is to find protection at an. it must find it some- where in our forests. It is often claimed that the proximity of forests to agriculture makes them a constant source of harassment to the cultivator. If this argument is pushed to its logical conclusion the only remedy would be to remove such protection as is now give & too wild animals in our forests for it would not be possible to remove this menace entirely until all the large wild animals in them are killed or die of wounds, or are exterminated over large areas because of their inability to breed. Surely our goal is not the total extermination of our wild life which is what must inevitably happen unless some form of protection is given to it within its natural domain. While it is essential that the cultivator should have reasonable latitude to defend his property it is equally essential that there should be certain areas or reserves where the shooting of animals is regulated and where the laws for their protection are rigidly enforced. Such reserves exist-roughly about one-third of British India and Burma consists of reserved forest-but, while we have extensive forests to shelter it and laws to protect it our wild life is every- where on the decrease. The time has surely come when it is necessary for us to review the position and to take such measures as are necessary to give real protection to the wild life of the country. It is the opinion of some that these great State-owned forests where laws now operate for the protection of animals, are and must continue to remain the natural sanctuaries of wild life in this country, and that they will adequately fulfill the purpose of protection if they are effectively warded. The correctness of this view depends entirely on the actual conditions in a particular Province. The extent and nature of the forests, their accessibility, the density of the population, and the extent to which cultivation surrounds them are factors which must influence the issue. It may be found that in certain Provinces the establishment of a national park or reserve in specially selected areas will provide the only means of giving adequate protection to wild life without hampering agricultural development. It is certain that the creation of such a reserve or national park would give a special status to it, and thus facilitate the passing of special laws made applicable to such an area. Further, the actual selection and declaration of certain definite areas as a National Park would have the practical effect of forcing on the attention of successive generations of officials the importance of saving these areas from any danger of deforestation and the necessity for taking all practical measures to preserve the wild animals found within them. The author hopes that this book will do something towards drawing the attention of people in India to the magnificent heritage which Nature has given them in this country, and that it will help them to realise the need for preserving this legacy to their own advantage and for the enjoyment of generations to come, who with the spread of education will be in a better position to appreciate its worth than we are today. There is need for the creation of sane public opinion on the subject of wild life protection in India. At present such opinion hardly exists and, even if it does, in some quarters it may be antagonistic. This is mainly because people do not know, nor has any attempt been made to teach them, something of the beauty, the interest, and the value of the magnificent fauna of this country. In most Western countries there is a wealth of cheap and popular literature dealing with the natural history of those lands. In India such literature as exists is either unintelligible to the average reader or sold at a price beyond popular reach. Again, in most Western countries Nature Study is a serious part of the earlier stages of the school curriculum. While it's main object is to develop the child's powers of observation, it creates a love of Nature and a sense of companionship with life out of doors. It is true that in India, Nature Study forms part of the curriculum in our primary and secondary schools. But often teachers are handicapped by the want of suitable books which they can consult. 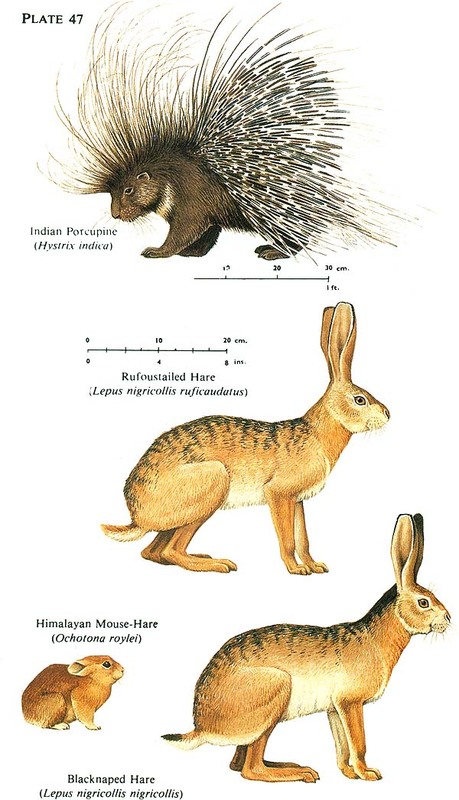 This book is therefore written with the purpose of providing a popular and well- illustrated account which will give people general information about the mammals of India. Dunbar Brander, A. A. Wild Animals in Central India. Evans, G. P. Big Game Shooting in Upper Burma. Burrard, G. Big Game Hunting in the Himalayas and Tibet. Stewart, A. E. Tiger and Other Game. 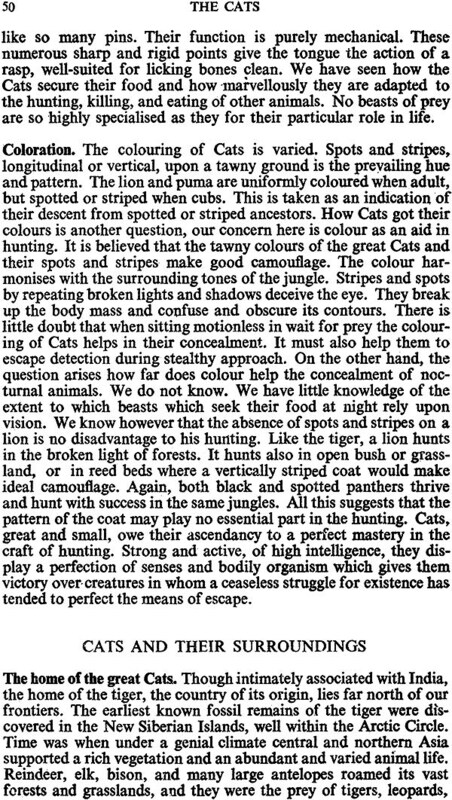 Stockley, C. H. Big Game Shooting in the Indian Empire. Champion, F. W. With a Camera in Tiger-land. Champion, F. W. The Jungle in Sunlight and Shadow. Lydekker, R. The Great and Small Game of India. 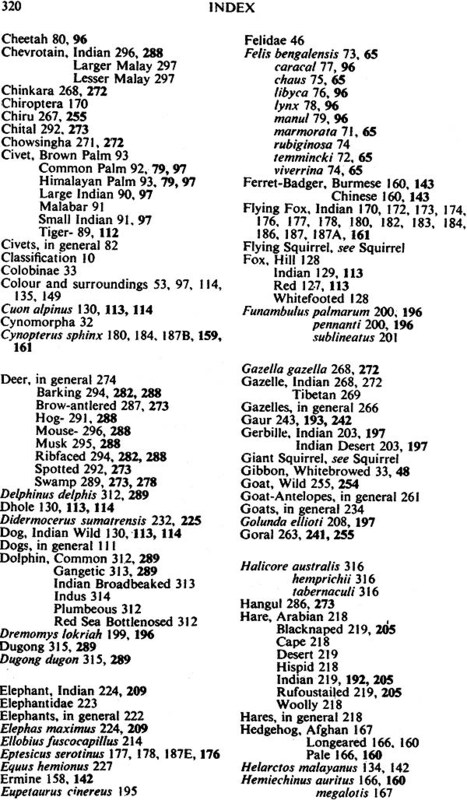 Lydekker, R. Catalogue of Ungulate Mammals (B.M.). 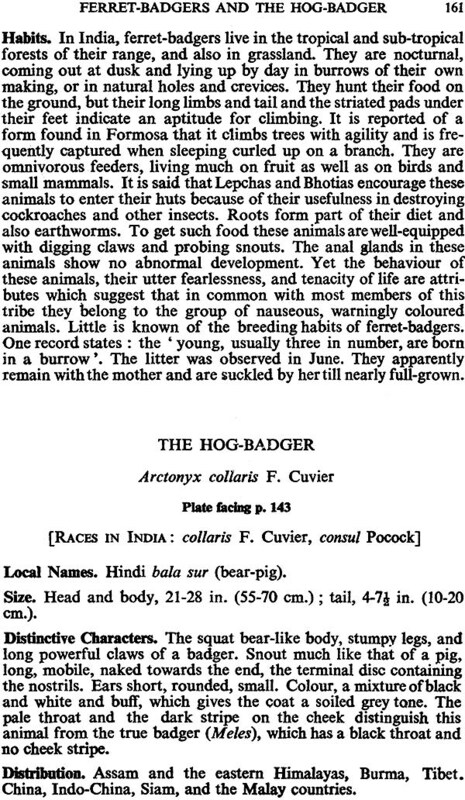 Blanford, W. T. The Fauna of British India, Mammalia. Pocock, R. I. 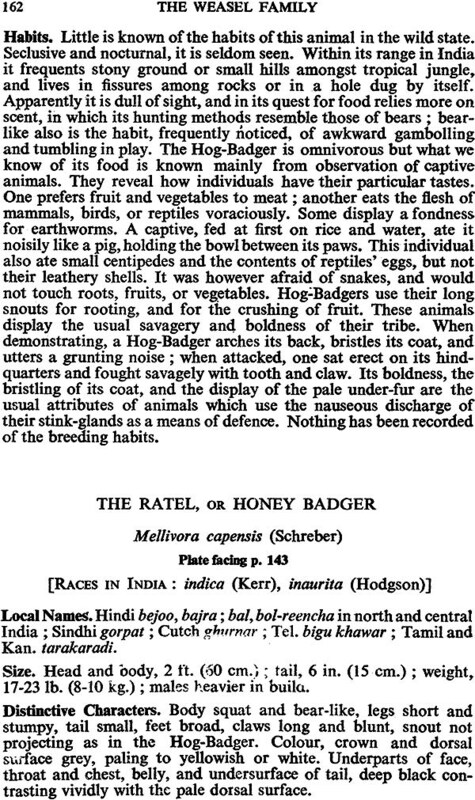 The Fauna of British India, Mammalia, Vols. 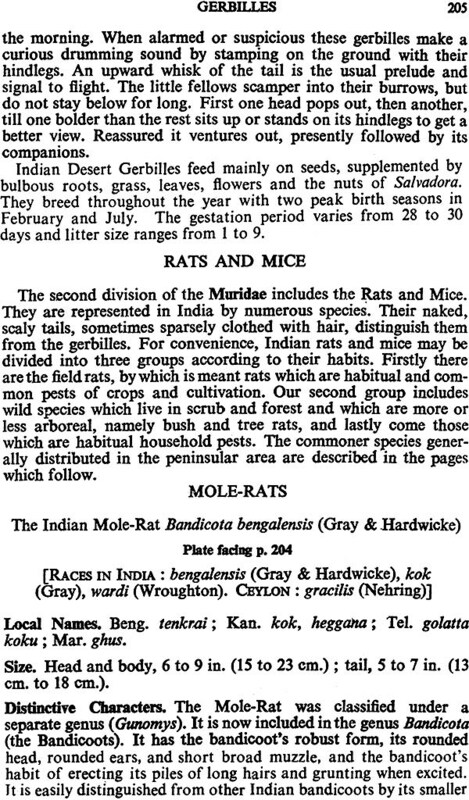 Jerdon, T. C. The Mammals of India. British Museum. 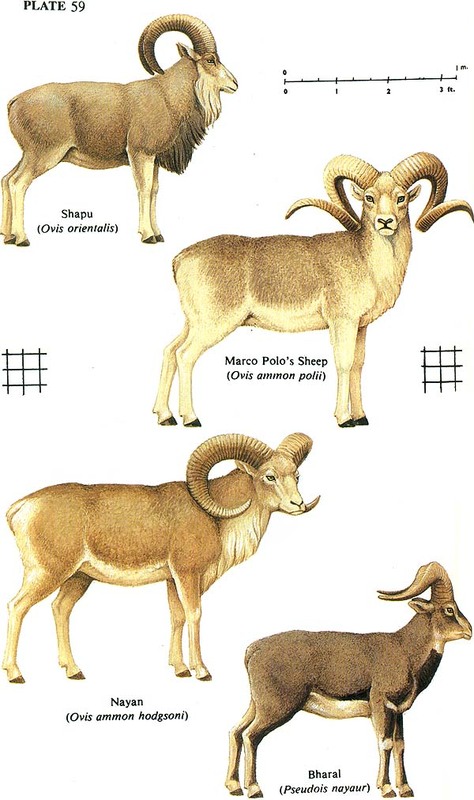 Game Animals of the Empire. Our ability to undertake this expensive work was due to the generosity of the late Mr. F. V. Evans. a Vice-Patron of the Natural History Society and one of its most generous benefactors. Our thanks are also due to their Highnesses the Maharaja of Bikaner, the Maharaja of Morvi, the Maharaja of Bhavnagar, the Maharaja of Travancore, and the Maharaja of Mayurbhanj. the Sir Ratan Tata Charities. and Mr. F. E. Bharucha for their donations towards the cost of printing. The author wishes especially to thank Lt. Col. R. W. Burton and Mr. R. C. Morris who kindly read through the manuscript and offered valuable advice and suggestions.